Fill your home with the warmth and character that comes with a selection from our stunning collections of hardwood flooring. Take your home up a notch with our flooring. Rely on our friendly design specialists to help you find the right flooring option. We work with you every step of the way—from selection to installation. Visit our store soon and let us give you a tour of our vast selections of solid and engineered hardwood. Hardwood flooring is a durable and attractive surface that makes a sophisticated and stylish statement. Enhance the value of your home with our engineered hardwood and solid hardwood floors. When you speak with our sales associates, we take the time to understand your lifestyle and home décor needs. 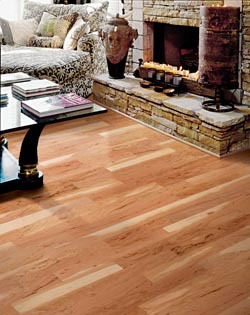 If you prefer a rustic look for your den or living room, our inventory of handscraped hardwood is a smart alternative. Whether you are in the market for a light and modern look, or a more traditional and darker grain, we have the hardwoods you are looking for. Replace the worn and fading floors you have been living with for years with our value-added selection of flooring. Our team is here for you throughout your flooring purchase. We help you find the right type of floor for your home, and we ensure you get the best fit for your investment with our competitive pricing on hardwood flooring installation. Take advantage of the latest advancements in flooring design with our engineered hardwood. This product is created through a process that involves combining several layers of pressed wood with a natural hardwood veneer. The result is a stunning floor that looks and feels as great as traditional hardwood. Enjoy the natural look of wood flooring with our budget-friendly engineered hardwood floors. Unlike natural hardwoods, these floors won’t expand and contract with changes in temperature. This ensures there is no need for expansion joints and you avoid any damage to the surrounding walls. Engineered hardwood is also an affordable alternative for those who are trying to get the most out of their interior design dollar. The value is clear when you see the results in any area of your home. In addition, these floors are better able to withstand the constant impact of kids and pets, and that extends the lifetime of your home investment. Experience the timeless elegance of solid hardwood floors in your home with the help of the team at our store. We make it easy and affordable for you to get a surface in your home that is created from a solid cut of the natural wood of your choice. If you decide to change the interior décor of the room you have installed our solid hardwood in, the process of resurfacing and staining is easy to accomplish. Protect the subfloor of your home and enjoy a surface that is devoid of seams and cracks that dirt and dust can hide in. This makes your solid hardwood floor easier to clean, which gives you more time to enjoy other things. Protect your kids and pets from the effects of harsh cleaners and chemicals by installing these floors, as they only require a light cleanser and a mop to clean. This durable and reliable variety of flooring is available to you as a prefinished, unfinished, or fully finished surface depending on your request. The natural grain provides you with a unique pattern that is based on the species you choose. Purchase your new floors with the confidence that comes from our Price Protection Guarantee. This assurance covers all of our hardwood flooring options and helps you get the best value for your investment. If you find a better price on the floors you have purchased with us, we are more than happy to refund you the difference in price right away. When your design plan calls for a surface that reminds you of the frontier experience, our selection of handscraped hardwood is the solution. This flooring option is perfect for a classic bungalow or your cozy and comfortable den. These floors create an eye-catching, lived-in look that adds style and charm to any room you are renovating. Protect the investment you are making in your home by taking advantage of our hardwood flooring installation team. These professionals understand what it takes to get the best fit in your home, and you save time and money in the process. Our team has the right tools to get the job done properly, and the difference is clear once your design project has been completed. With our Four or Five Star Flooring and our Confidence Plus™ warranty, it makes sense to choose our store for all your flooring needs. Our team is focused on getting the right fit for you, and that’s why our installation process guarantees to extend the life and looks of your floors for years to come. Contact us today to get a free estimate on our selection of solid and engineered hardwood. We proudly serve the communities of Johnstown, Somerset, Latrobe, Derry, Greensburg, Pennsylvania, and surrounding communities.